Q1. Please brief our readers a little about yourself. Q2. What has been your formal education and how did modelling & fashion come into the picture? Q3. Tell us about your first ever modelling / acting gig. Q4. Your profession is very glamorous and thus people only look at the bright side. Why don’t you throw some light on your struggling days? Q5. You are also a Cosplayer. We would love to learn more about that. Q8. Could you give out some tips for someone who wants to pursue modelling and acting as a profession. Ayendri is a professional model and actress. She has worked for renowned brands like L’Oréal Professional India, Himalaya, Honor mobiles, etc. Apart for modelling, she has recently stepped into the acting industry and has done some serials and films. She is also a Cosplayer and one of the early players in India. Q1. So excited to collaborate with you! The first time I heard you speak was an instant sign that I wanted you up on #InspireMe. Please brief our readers a little about yourself. Ayendri – Hey! Thank you so much for making me a part of such a cool and inspiring interview session. I am Ayendri Roy, I’m a professional model and actress. Well! I had started my journey at a very young age, I was just 17. Now am 19+, so within these 2 years, I have worked for some renowned brands like L’Oréal Professional India, Himalaya, Honor mobiles and many others. I am both print and ramp model.Then am into acting too. Currently I’m working for serials and films too. I started my journey at the age of 17. Ayendri – Well! I am a first year history honours student. I can say it’s my childhood dream to walk like a model on ramp and to do photoshoots with some famous photographers like Daboo Ratnani and Sourav Dua by experimenting with different expressions. I have grown up watching Diandra Soares, Sheetal Mallar, Bipasha Basu; I used to follow them like anything. So I think I was very sure that I will be a part of this industry in future and I think I was very confident about myself and my dreams from childhood. So I am here today as Professional model and actress, dignifying your questions with answers. I was very confident about myself and my dreams from childhood. Q3. You have bagged some pretty good projects at a pretty early age. Tell us about your first ever modelling / acting gig. Ayendri – My first ever project was with Keya Seth Exclusive and yep that also happened because of a coordinator I don’t remember his name now, but his nickname is Vicky. And my first big project was with Club Salon, which also happened because of my coordinator Ankita Mondal, she is a business woman now. I was really excited to work for such a great name for the first time. And if you ask me about my first acting project then I would like to thank Snehashish Chakraborty Sir for making me a part of his project ‘Adorini’. I would like to thank Vicky, Ankita Mondal and Snehashish Chakraborty Sir for believing in me. Ayendri – I agree with you our profession is very glamourous but it is very uncertain too.So I think for an actor or a model that “Struggling days” never ends, you always have to struggle to prove yourself better from others. So it’s the same case for me too when I started my career I struggled a lot I use to audition for 10 hours a day to get a good shoot. I sent my folios to different production houses and different coordinators to get a call for a shoot. “Struggling days” never end, you always have to struggle to prove yourself. Q5. You are a Cosplayer. We would love to learn more about that. Ayendri – Yes, am a cosplayer. I work for Virtualinfocom. I am always very thankful to Mr. Arijit Bhattacharya for making me a part of such an innovative idea, which is a very new thing here in our country atleast. I play the role of Shaina, a magical warrior. During my childhood days I was a fan of SPD power rangers or Mystic forces and I think it was also cause to say a big yes to this project. Cosplay is a contraction of costume play. It’s like a hobby in which participants called as cosplayers, wear costumes and fashion accessories to represent a specific character. Since 1990s, it’s like a popular culture in Japan and some parts of Asia and in the western world. The term cosplay was coined in Japan 1984. From early childhood, I was a fan of SPD power rangers & Mystic forces. Q6. How has the family support been so far? Does anyone object about your profession? Ayendri – Well, my family is a very supportive one; I have never heard that word ‘no’ from them. My parents never opposed any decisions of mine they always trust me. I always thank God for blessing me with such parents. I have never heard a ‘NO’ from my parents. Ayendri – Yep, I think people like my work till today and I always get good responses and I think that inspire me to work hard. People inspire me to work hard. Ayendri – Sure, I would say that girls and guys who are dreaming to get into this industry, I will suggest you to keep yourselves fit and healthy, workout properly, work hard on your expressions, watch out YouTube videos to learn about ramp walks, Study about this industry, follow up works of some famous people and know about their struggles, this will inspire you people a lot. 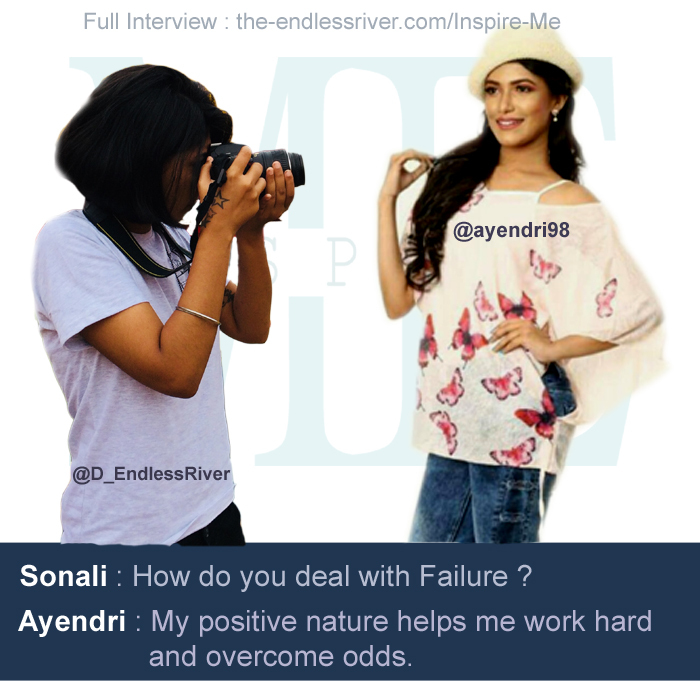 Ayendri – I have faced many failures but never been into depression. I am always a very positive kind of a person. I knew how uncertain this Industry is. One-day you may have many linked up projects, money and fame and on the other day it may happen that you won’t have anything anymore. So I think my positive nature helps work hard and overcome odds. Ayendri – I think 2017 was a great year for me; I got my first breaks both for serial and film. And yes I have so many plans for 2018, but I won’t share it now but yes I can say that I will work harder this year and would definitely try to grab good projects. I wish to work harder this year.